DAP is a partnership between the NYS Department of Agriculture and Markets and the NYS Department of Environmental Conservation, created with the goal of making dairy farms more profitable while encouraging environmentally responsible growth. Farms can be awarded funding to help cover the cost of a business plan focused on growth, design of new or remodeled facilities or development of environmental and farmstead plans. 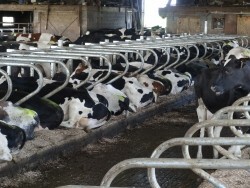 For more information, visit http://prodairy.cals.cornell.edu/dairy_acceleration/. John and Steven Ohol are brothers and partners in Loho Farms, LLC, a 120-cow dairy located near Lockport in Niagara County, NY. Last fall they applied to the Dairy Acceleration Program (DAP) for support in forming a farm business plan. I served as the facilitator for the project, and Randy Risjan of Farm Credit East served as the business planner. At the time of the application, John and Steve were running the farm with the help of their father, uncle and two employees. The process of working with Randy to create a business plan helped them to define two major goals: a) to improve the farm’s financial viability through increasing farm profitability and cash flow, and b) to improve labor efficiency. When I stopped by the farm in July, I was amazed at the progress that the farm had made! To work towards the goal of making the farm more financially viable, the owners focused on ramping up milk production. The installation of new curtains and waterbeds has certainly improved cow comfort, proven by the fact that milk production has increased from 55 to 70 pounds. They also bought 10 animals in order to fill the freestall and fully utilize its capacity. To improve reproduction and eliminate the need to purchase replacements, Steve took an AI course and started breeding their own heifers. They are considering using AI on cows as well. Plans are in place to cover the barnyard where the heifers are housed, which will also facilitate growth in the heifer herd. Labor efficiency in the milking parlor at Loho Farms greatly improved with the installation of a low line and six new milking units. The double six herringbone parlor was originally equipped as a swing parlor with weigh jars. The new equipment has cut milking time by about an hour per shift. The farm’s goals for coming months are to continue to work towards higher milk production and utilization of AI across the herd. Within 3 years they would like to make the transition to a robotic milking system. John said it was easy to work with DAP- the application and other paper work was easy to complete and didn’t create much extra work for him. DAP covered 80% of the cost of the business plan, up to $5,000 and the farm was responsible for 20% including any amount over the value of the award. The approval of additional funds for DAP is anticipated and applications to participate are still being accepted.